Wandering away is a common risk among elderly individuals suffering from dementia. These episodes can be terrifying, leaving families desperate to find a secure and safe place for their loved ones. Nursing homes promise to be that place. They gain your trust with assurances that your loved ones will receive a constant level of care and/or supervision. Regrettably, these promises are often broken. When nursing homes do not have the proper staff in place or those staff members lack proper training, residents can wander out of the facility, leading to serious injuries or death. A resident wandering off from a nursing home (also known as elopement) is almost always avoidable with proper precautions. The experienced Los Angeles nursing home negligence attorneys at Taylor & Ring fight on behalf of your loved one and your family. Our cases and advocacy send an important message that nursing home companies must put residents’ well-being ahead of everything else. Trust our lawyers to give your loved one a voice. According to the Alzheimer’s Association, 6 out of every 10 people with dementia tend to wander. The behavior stems from cognitive impairments, where the individual is easily confused, with no memory of his or her own name or address. They often wander away from their location and then forget how to get back. These incidents are particularly common among new nursing home residents who may feel bewildered by their new surroundings and wander off with plans of returning home. That is why nursing home workers need to be vigilant to ensure that the residents are always safely on the premises. Robbery. 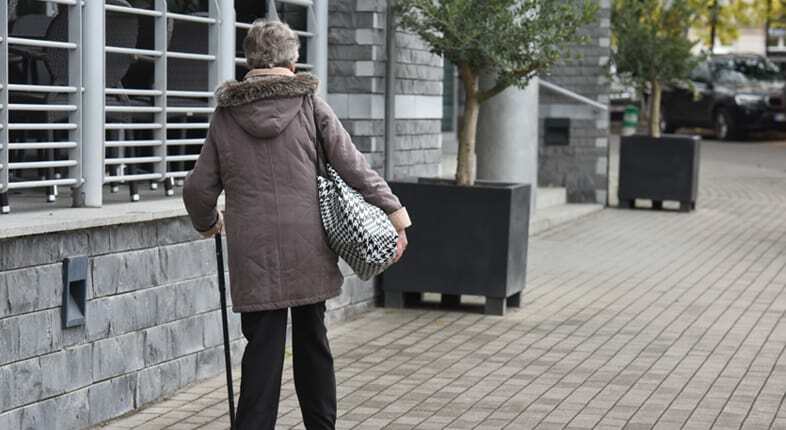 An elderly person walking alone can easily become a target for theft and robbery. This is particularly true for nursing homes located within or near high crime areas. The resident may be robbed of jewelry or any other items of value in their possession. An attempted robbery can cause lasting psychological trauma and significant emotional damage. Dog bites. An unsupervised nursing home resident may wander into a person’s yard under the mistaken belief that they are approaching their own home. A dog may attack and bite the resident, possibly causing severe physical injuries. Assault or sexual assault. The elderly are particularly vulnerable to assaults when not protected by a caregiver. Wandering alone places the resident at risk for physical assault, as well as sexual abuse. The inability of a frail, elderly individual to fight back makes them attractive to sexual predators. Slip-and-fall accidents. While wandering, an eloping resident may experience difficulties walking. He or she may have balance deficits that can lead to falls. Inattentiveness to curbs or dangerous terrain can also result in an injury-causing slip and fall. Getting hit by a car. A wandering resident may not pay attention to traffic, walking into the pathway of an oncoming vehicle. This can be a particularly dangerous situation in areas close to busy roadways or if the resident wandered away from the nursing home facility after dark. Pedestrian car accident injuries can be severe, if not fatal. Threatened third parties. It is not uncommon for a wandering elder to enter or attempt to enter another party’s home, with the mistaken belief that they live there or know someone who lives there. This type of situation can become especially dangerous if the homeowner feels compelled to protect his property or family. He or she may forcefully detain or even shoot the eloping nursing home resident. Any of these scenarios can quickly turn into tragedies. Our skilled Los Angeles nursing home neglect attorneys have a lengthy track record of sticking up for the elderly and others living in nursing homes or other assisted living facilities. We understand how California’s strict elder abuse laws work and how to adequately apply them. If your loved one has been neglected or abused, we will use our substantial knowledge to assist your family and help your loved one secure compensation for pain and suffering. If a nursing home cannot bother to put properly trained staff in place, then it should not be open. When a nursing home company’s negligence endangers your loved one, contact Taylor & Ring to get help from dedicated Los Angeles nursing home abuse lawyers. Complete our contact form or call us at 310-776-6390 to schedule a free initial consultation.